Postgrad composer Andrew Fowler tells us about the composition-fest that rounded off the academic year: On the third and fourth of July, the University of Southampton played host to its annual composer’s ‘Get Together’, which consisted of talks and workshops aimed at sharing the work of composers affiliated with the university and guest musicians with one another. Unsurprisingly, the event was entirely successful in achieving its objective. The musical interests of Southampton students and graduates alongside musicians based in Cologne, Dublin, Ghent, Huddersfield, London created a rich cornucopia of aesthetic ideas for discussion and experience, opening the gates for an international network of professional and personal relationships to flourish, as well as encouraging artistic inspiration from such a vibrant kaleidoscope of colourful visions. The first morning consisted of talks by Southampton PhD students and guest performers. 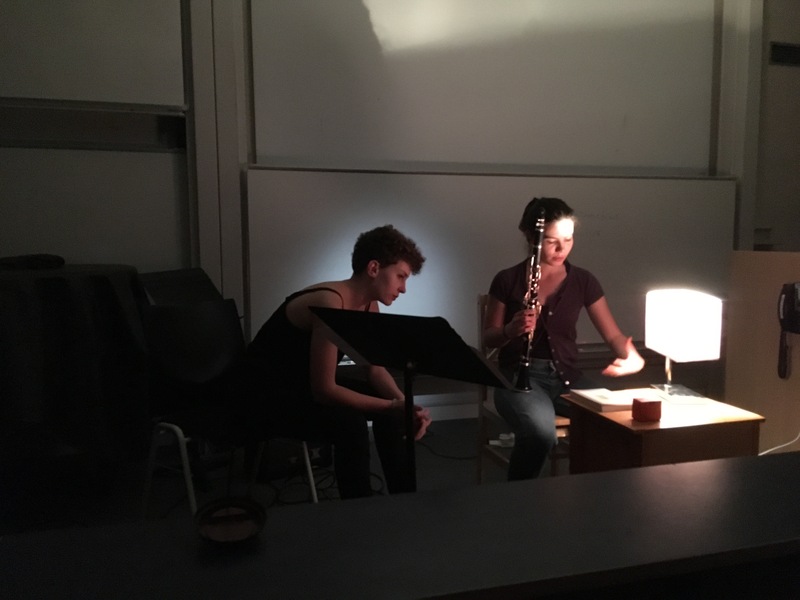 This included introductions by the incredible performers, Filipa Botelho (clarinet), and Tom Pauwels (guitar), who would continually mesmerise their audience with the enthusiasm and skill with which they approached each workshop over the two-day period. Presentations were also given by current PhD composers Peter Falconer, Olly Sellwood, and Blake Troise, who discussed and gave examples of their work: a comically dry sound walk through campus gardens; a subtle and entrancing electric guitar quartet; and 1-bit coded pieces with the data size a seventieth of that of a blank Word document (seriously), respectively. The afternoon saw workshopped three pieces by Katie Bamford, myself (Andrew Fowler) and Peter Wilson. Katie’s piece, which utilised guitar and delay, evoked the sounds of the Westminster quarter bells through intelligently placed harmonics referencing spectral composition. My own piece, which employed clarinet and delay, sought to incite a frenetic quality into the performer which Filipa conveyed spectacularly. A meditative atmosphere was achieved in Peter’s work for guitar with 30/40 second delay. This rendered notions of nostalgia and memory as the repeated material echoed in the distance, distinctive but subtle. 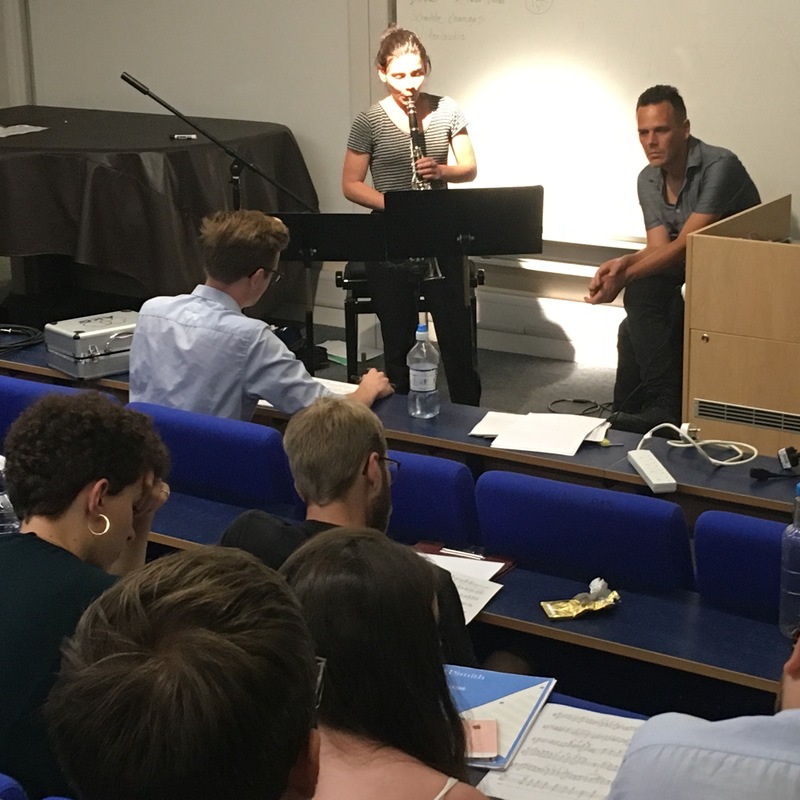 In each workshop, Filipa, Tom and those present offered suggestions and opened a dialogue with the composers to help enhance the workshopped piece. This concluded with an informal dinner which allowed participants to discuss the workings of the day, converse and enjoy a smashingly good curry. The music of Helena Cnovas Parés, Colin Frank and Jamie Howell was workshopped on Wednesday. Helena employed Filipa in a theatrical manner to play out a delicately playful night-time ritual which drew attention to beauty of such ordinary actions combined with a twist on the classic expectations of a lullaby. Colin’s work inventively required Tom to play one guitar using another set ontop; the physical gestures as much a part of the composition since the wondrous sounds produced were an unstable by-product of Tom’s motion. A seemingly staple trait of his work, Jamie’s two pieces for clarinet and delay pedal suggested the role of performer as player in a game who helps shape the piece as much as the composer. In one piece, this included navigating a network of notes at will, the snowball effect building into a dense texture. In the other, Filipa interacted with her own delay to produce new material. To round off the Get-Together, Joe Manghan presented his crowdsourced composition, which was based upon Coldplay’s Yellow. 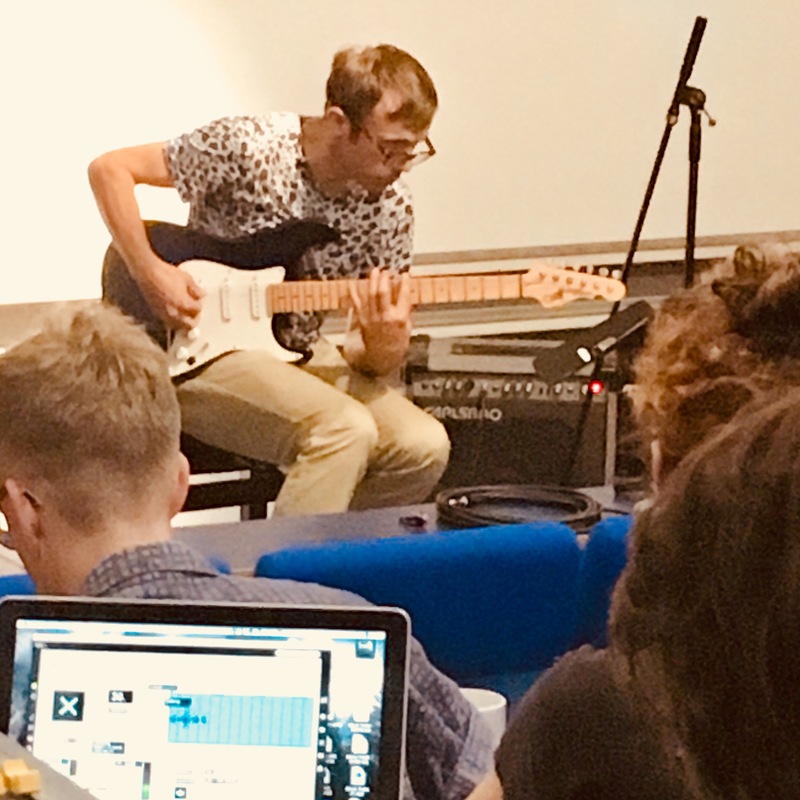 The participants voted through various musical options offered by Joe and watched as the original material gradually morphed into something very different. This required the lightning fast Sibelius skills of Ben Oliver and the continually impressive talents of Filipa and Tom who sight-read increasingly absurd versions of the Coldplay. The Get Together was an invaluable experience for a young composer. 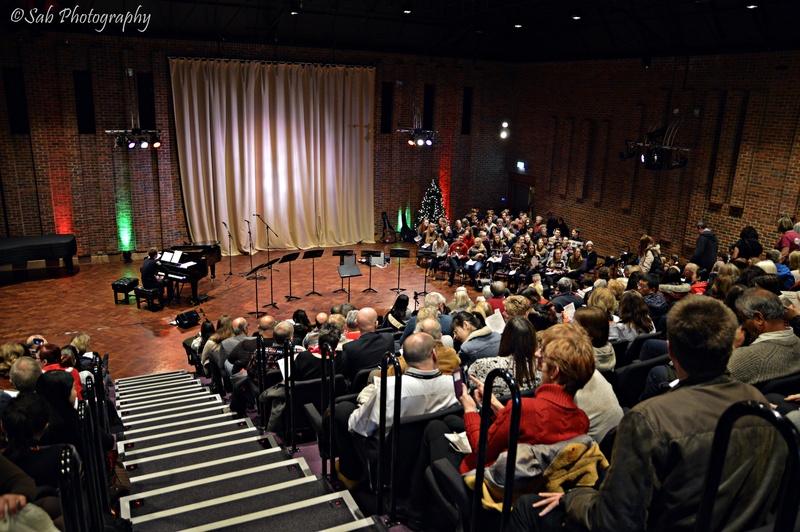 Not only did it allow for workshops of student and graduate pieces, but the opportunity to network with a number of highly talented musicians is not to be taken lightly. Certainly, hearing and watching everyone discuss their music and work on a piece is profoundly educational and inspiring. This type of event opens musicians to a wide range of practices and allows for interchange of artistic ideas, which I hope I can continue with those I met during the event. I encourage any student who has an interest in new music to attend any further events like this. The only detriment currently is the numbers present; even more support from staff and students of Southampton will undoubtedly be welcomed. I must extend my gratitude to Ben Oliver, Matthew Shlomowitz, Alex Glyde-Bates, Filipa Botelho, and Tom Pauwels for all their hard work and for everyone else that helped organise this event; their effort has definitely paid off.